Please click on the Links to download your FREE Sample! Favorites selections from the angelic tape series for your relaxation, meditation and healing. You will love the beautiful sounds of piano, strings, flutes and angelic choir. An exquisite blend of instrumental sounds that open the heart and uplift the spirit. Enjoy this musical tapestry of wonderful piano, strings, synthesizer, angelic choir, ocean sounds and more. Music Inspired by Archangel Michael. (Story of how Angel Michael came to Ann with this music is told in chapter 10 of, "Angels Speak.") Enjoy this spiritual symphony of beautiful piano, harp, angelic choir and ocean sounds. A musical journey of healing, transformation, and empowerment. A beautiful album of celebration and joy. The joyful, clear sounds of a brass choir of trumpets, trombones, french horn, chimes, strings, piano, and angelic choir introduce this album. The music accelerates and celebrates the dawn of a New Millennium. Wonderful healing chimes, bells and angelic voices accompany the magical themes and melodies in this new album. The music is excellent for meditation, healing, and relaxation. "Beautiful New Published Book, "Angels Speak," by Ann Warner and Helene Rothschild. A heartwarming and touching, true story about Ann's divine encounters with the angels. New CD! "Angelic Music From The Heart." Featuring Guided Meditation, "The Healing Waterfalls," and beautiful sounds of waterfalls, angelic voices, pan flute, harp, piano, strings, healing bells, soft chimes and more. Nine wonderful selections include: "Angels Are Forever," "Heart of Love," "Golden Angel," and "River of Light." You will treasure both this wonderful, inspiring book and beautiful, healing music of the angels." IN MEMORIAM: To all those who made their Transition from Earth on September 11, 2001. May the Angels of Love and Comfort assist us all in our Healing and Renewal. NEW RELEASE! ' 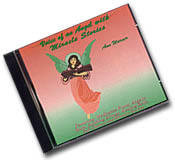 Voice of An Angel -- with Miracle Stories' Beautiful, healing music and miracle stories -- words spoken by Ann. True stories and experiences of miracles and angels. Cover includes the remarkable story of Ann's vision of Ten Thousand Angels. TITLES: I Heard the Voice of An Angel, Healing Light, Ten Thousand Angels, Fly With the Angels, The Angel's Touch & more. FEATURING: meditative piano, angelic harp, soothing strings, spoken words, healing bell, soft chimes. Many listeners have heard and seen the angels while experiencing the angelic music. You will love this album! Im so grateful! I love you! The Healing Angel cassette tape with a guided meditation. A VERY special album of angelic, healing meditation with 2 guided meditations and angel music background. The Healing Angel guided cassette tape is loved by many listeners around the world. Listeners have reported healings, unusual events and have see the angels when listening to this wonderful, unusual cassette tape by Ann Warner. FREE BROCHURE available. ANGEL READINGS. Full Length or Mini-Reading. Do you have questions? Ask the Angels. Meet your wonderful Guardian Angel. Send an email to Ann for more details. one of the alternate server links below. Each sample is in .wav format and takes 3-4 minutes to download. It is my desire that all who visit this page may experience love, peace and comfort. If anyone has a special need, please feel free to send an Email. I will remember you in thought, prayer and meditation. Meditation: Visualize a beautiful Circle of Angels. You are in the center of the circle. A rainbow of light is shining down upon you; you feel great peace and contentment. Affirmation: Say aloud or silently, I am a loving child of the Light. Nothing can hold me back. I walk forward with a feeling of confidence and strength. So be it... and it is so. "ANGEL MUSIC" Ann has recorded a beautiful series (9 cassettes and 7 CDs) of Angel Music for relaxation, meditation and healing. Strings, flutes, piano and angelic voices create a wonderful blend of sound. Listeners have said the music is very heavenly. The music can be found throughout the United States and in many countries of the world. Hundreds of people have been able to heal and empower themselves as they have listened to the music. The Great Silence Is Within. Ann`s music is dedicated to people everywhere on the planet, and is given with love, joy and peace. in any way without the express permission of Ann Warner.